Stone is a popular material for kitchens and baths. Dont end up using stone in a generic way, read this article for some unique design inspiration. This pedestal sink, pictured below, is made of a beautifully polished Maple Leaf Red granite stone. Consider incorporating some color into your bathroom using stone. Adding columns to your kitchen creates a beautiful contrast and helps to highlight your cabinets. Isis Gold limestone rope-twist columns and carved pediment frame this luxurious custom Sub Zero refrigerator. If you are going for a rustic look, a carved natural boulder sink is the way to go. It is truly a one of a kind design. A polished Absolute Black granite sink will make a statement in any bathroom, and complement nearly any decor. Marble is a luxurious material; perfect for a tub to relax in. A rock-face finish on an apron sink creates a distinctive look. It can really be a focal point for your kitchen. 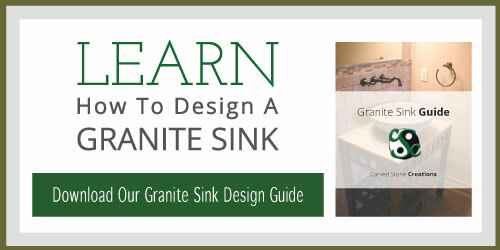 If you want a kitchen sink that blends in a bit more, think about an undermount sink. 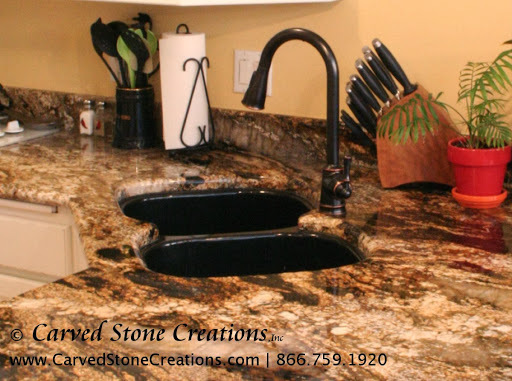 The sink in the picture below is a beautiful black granite that accents the countertops nicely. Create a unique look in your guest bath by placing a rough granite vessel sink on an open wood cabinet with a custom stone vanity top and backsplash. Choose a stone with a bright color like the vessel sink pictured below to add a different flair to your bathroom. Pair it with a decorative iron sink stand or marble accents for an even greater wow-factor! Whether your sink or countertops are stone or not, complete your bathroom decorating with the bold colors and patterns of an onyx or marble accessory set. The varied color within each stone creates a one of a kind look. There you have it, 10 unique design ideas for the kitchen or bath using stone. Next time you are thinking of a kitchen or bath remodel, consider spicing things up a bit with one of these unique designs.